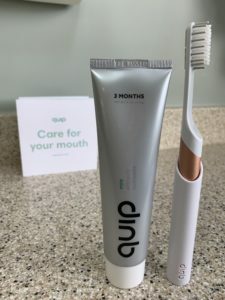 Recently, while watching TV with my husband, I saw an ad for this cute little electric toothbrush with an equally cute little name – quip. 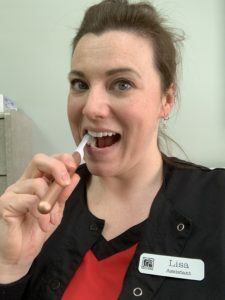 As a dental professional and a strong advocate for electric toothbrushes, I quickly decided that I must try this quip brush! Off to www.getquip.com I went to find out more. After a few minutes of exploring the easy to navigate website, I learned the theory behind this brush. quip was developed to help simplify oral health care and solve the problems that are typically ignored when it comes to oral health. Brushing too hard. Often times, with a manual toothbrush we tend to “scrub” our teeth, which can lead to problems such as gum recession or tooth wear. quip uses a nice, mild sonic vibration that along with slow, short stokes of the brush head on all surfaces of the teeth provides an effective, gentle cleaning experience. Not brushing long enough. Two full minutes is the recommended length of brushing time. quip has a built in timer in its motor. The timer gives a noticeable pulse after each 30 seconds, indicating when to move to another quadrant in the mouth. Not replacing brush often enough. Tooth brushes or brush heads should be replaced every 3 months. Um, yeah…. I’m definitely guilty on that one. This is the thing that I may be most excited about with this brush. 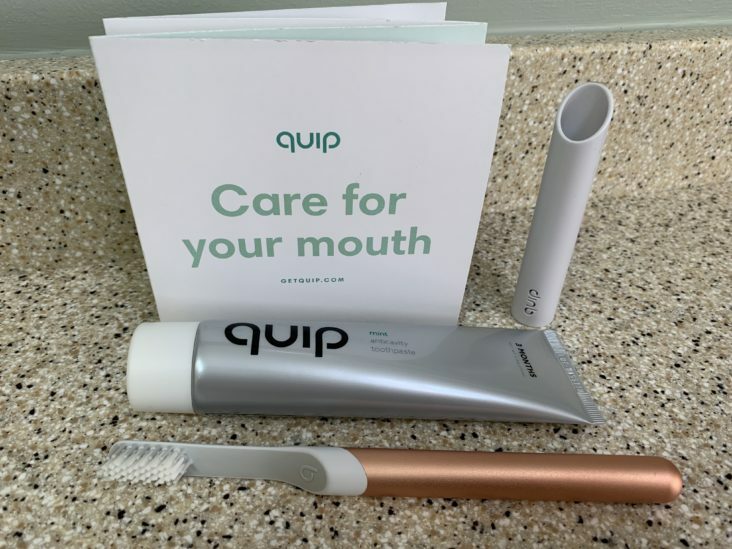 quip gives you an option to use a subscription service to have your brush head refills and a new replacement AAA battery (along with optional anti-cavity toothpaste for an additional fee) to be shipped to you every 3 months at an affordable cost. The subscriptions start at $5 per refill. Not brushing at least 2 times daily. Brushing should be done at least once in the morning and once before bedtime. Throw a little flossing in there too for good measure. Not visiting your dentist. A professional dental hygiene visit it recommended at least every 6 months – sometimes more frequently, depending on each person’s unique situation. Now here’s what we all want to know – How much does it cost? In each starter set, you get a quip brush, a multi-use cover/storage mount, and an anti-cavity toothpaste. The adult starter set with a plastic handled brush that come in blue or green, is $25, and the adult starter set for the brush with a metal handle that is available in silver, copper, slate or gold, runs $40. Then comes the refill option, which is, indeed, optional. Like I had said before, $5 gets you a new, replacement AAA battery and a new brush head every 3 months. For an additional $5, you can add on the quip brand anti-cavity toothpaste as well. The refills also ship for free. The pretty copper metal just called to me, so a few clicks later it was set to be shipped to my door and I had it about a week later! Check out my video to see my take on my new quip brush electric toothbrush!